(SPOILERS) Ana Lily Amirpour’s “Iranian vampire spaghetti western” (presumably the latter two references for the Morricone-esque music accompanying one scene), is something of a hoodwink, since, although its Persian-language and is set in the fictional Iranian town of Bad City, it was shot in California and Amirpour is Anglo-American. On the other hand, such background gives a fair indication of the medley of influences informing this stylish, witty little picture. The black-and-white photography and empty streets put me most in mind of ‘80s period Jim Jarmusch (with even a touch of Hal Hartley), but the pop culture persuasion Amirpour exhibits is more prevalent than Jarmusch’s idiosyncratic fixations. You can see echoes of Let the Right One In in Sheila Vand’s lonely vampire, befriended by Arash (Arash Marandi). And there are some similarities, albeit less abstractly, with (also 2014) Under the Skin. 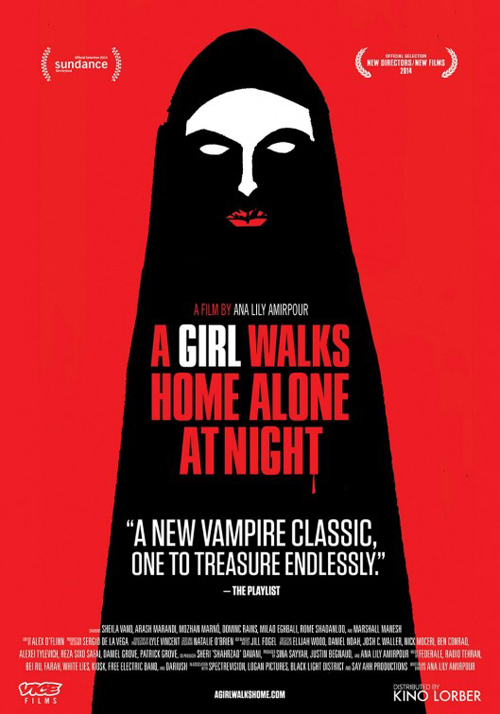 But Amirpour’s keen sense of humour keeps this from becoming too derivative; Arash’s James Dean-wannabe dresses up as Dracula to go to a party, leading to a winningly oddball scene where the drug-addled Dracula holds an early hours conversation with the hooded actual vampire. Vand, in her stripy top, appears to be consciously referencing the American cultural vampirism of Godard’s Breathless, in which Jean Seberg also wears a stripy top, while all around are wannabe gangsters (Dominic Rains’ drug dealer Saeed), overt musical influences (the soundtrack is superb, mixing Arab electronica with ‘80s grooves) and decadent western fast food (“I’ve never met someone who doesn’t like hamburgers”). Admittedly, the inclusion of drug addiction in a vampire movie is overly passé at this point, even if that addict is Arash’s father. The picture also takes a good 20 minutes-plus to find its feet, but once it does it’s full of lovely strange little moments. It also features the most marvellous performance by Masuka the Cat, making up for several rather unfortunate cat-related movies of late (The Grand Budapest Hotel, Inside Llewyn Davis). I’m not entirely sure how we’ll see Amirpour as a filmmaker a few years down the line. Certainly, someone who describes their films in pitch meeting speak (“Road Warrior meets Pretty in Pink”, “El Topo meets Dirty Dancing”) should probably be approached with caution as a sub-Tarantino type who favours cool over content. But, on the evidence of A Girl Walks Home Alone at Night, she has style, wit and smarts to spare, even if forthcoming cannibal love story The Bad Batch sounds like sophomore folly. Girl may not be that original under the hood (even the “What happens next?” non-ending feels appropriated), but its gorgeously shot, quietly affecting and charmingly performed.